The only way to master something is to do it over and over again. 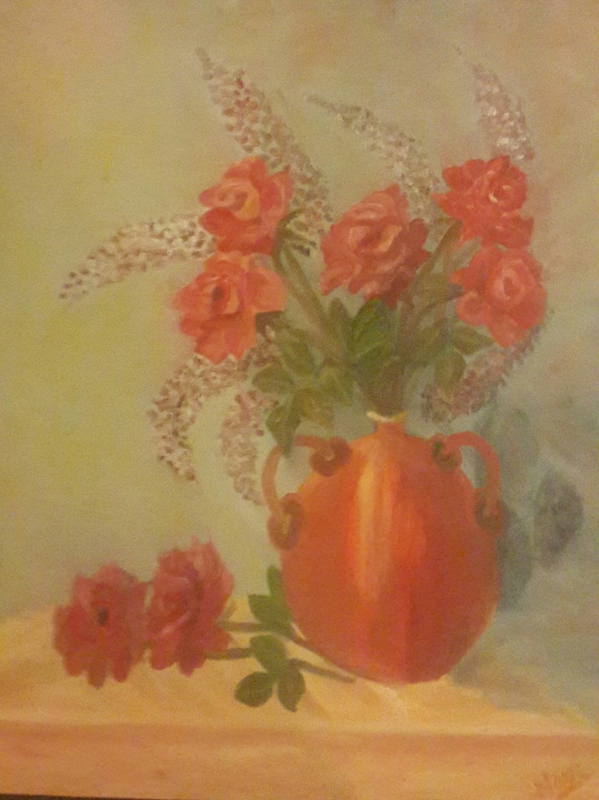 This painting is an attempt to paint the roses better and to show the reflection in a crystal vase. 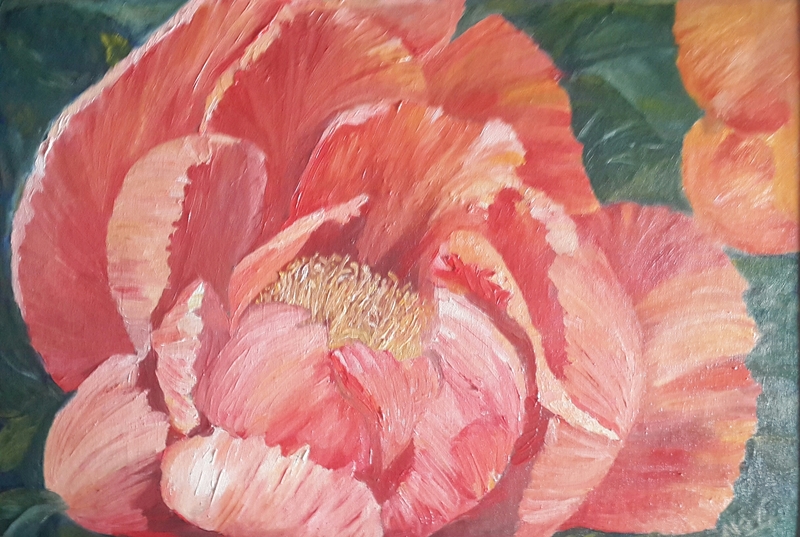 Roses have been painted using mixes of vermilion hue, crimson lake, ultramarine blue, cadmium yellow, lemon yellow and titanium white. The crystal vase shows patches of light reflecting on its surface. Also visible are the shadows cast by the flowers and foliage on the vase. The refracted stems of roses and water are visible in the vase. It’s rim shines with light falling on it. 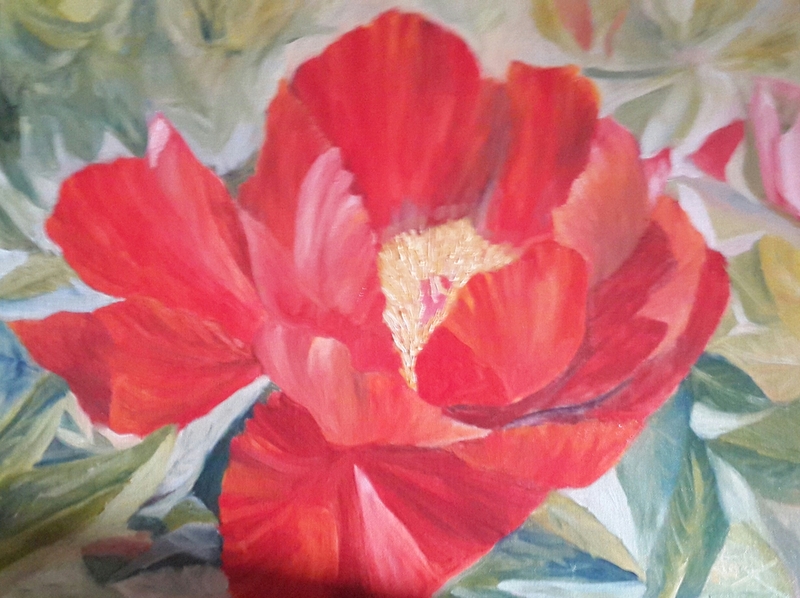 The edges of the wooden cabinet on which the flower arrangement is placed provide depth to the painting. The background colours are complementary to those of the roses. Ultramarine blue, cobalt blue, crimson lake, cadmium yellow and flake white have been used for the background. Roses de Nice on a Table is Henri Fantin-Latour’s painting that adorns the wall of National Gallery of Art in Washington DC. I was fortunate to visit it within few weeks of viewing the paintings in National Gallery in London. That gave a whole new perspective to appreciate paintings of famous artists in two of the major art galleries of the world across continents. The Dutch and Flemish galleries were very impressive. In the French galleries it was a surreal experience to be amongst some of the most celebrated works of Renoir, Monet, Manet, Cezanne, Van Gogh and Fantin-Latour in the West building and that of Matisse and Picasso in the East building. The gallery also presented an opportunity to appreciate the works of great American, Italian and Spanish artists. 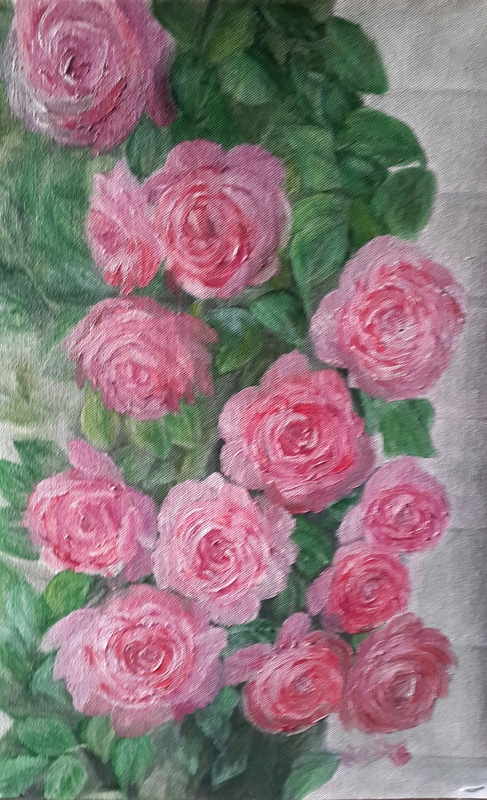 Once again, I have chosen to paint roses. What better choice could be there than to paint Fantin’s roses. 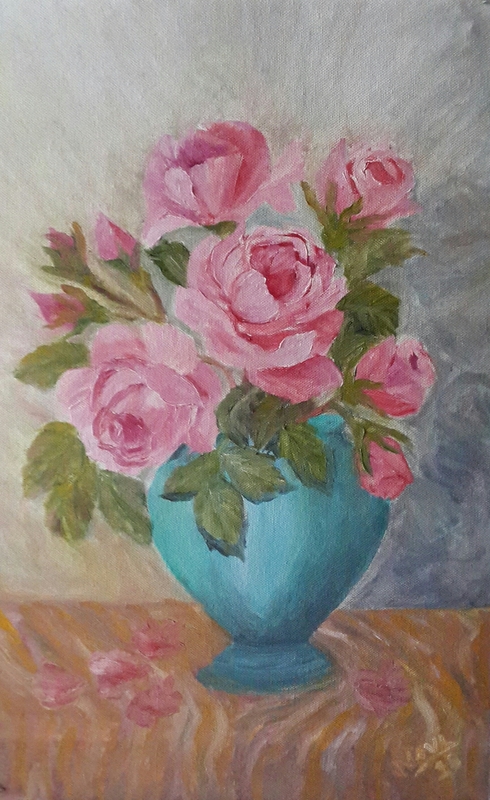 Roses de Nice on a Table is a painting from the French Gallery. The title of the painting is attributed to French city of Nice situated in Provence-Alpes-Cote d’Azur. So here I present my attempt at Roses de Nice on a Table. There is one red rose among the white, pink and yellow roses. As with ‘A Basket of Roses’, this painting too has a number of leaves. 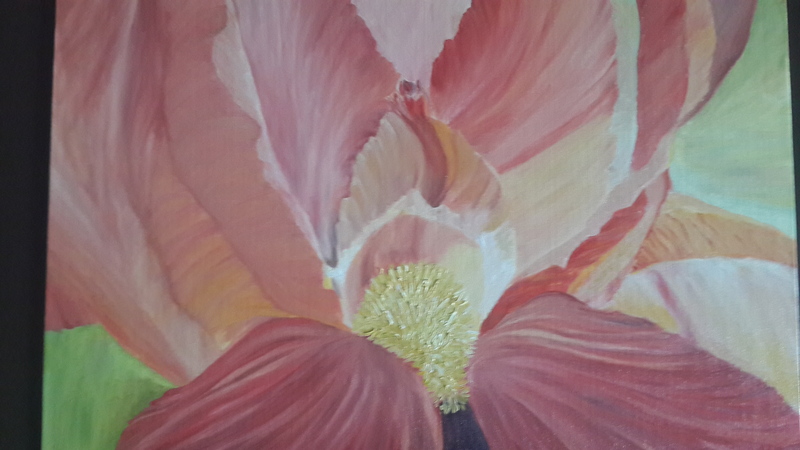 While painting, I always wonder how the white roses have tinges of red, yellow and blue in them. The Rosy Wealth of June is Henri Fantin-Latour’s painting that adorns the wall of National Gallery in London. 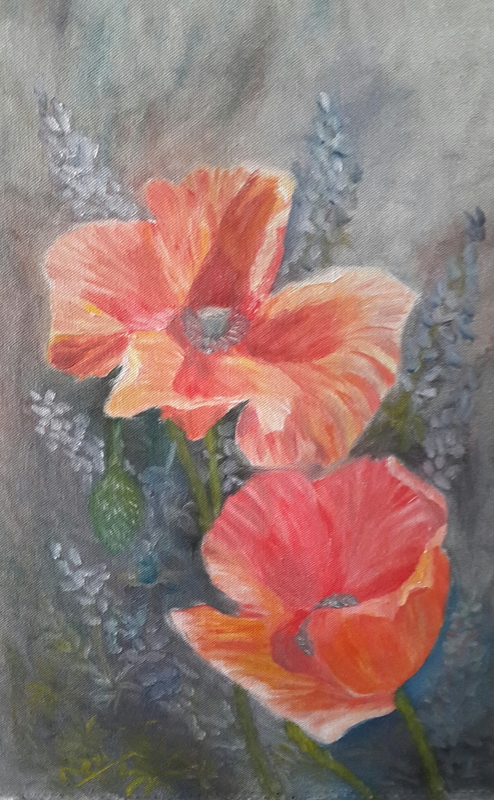 In this painting the artist has painted late summer blooms. The painting’s title was probably chosen to appeal to English patrons who outnumbered the ones in his own country during his lifetime. The sharpness in floral and still life paintings of Fantin matches that of Dutch and Flemish old masters. Here is my ode to the great master. 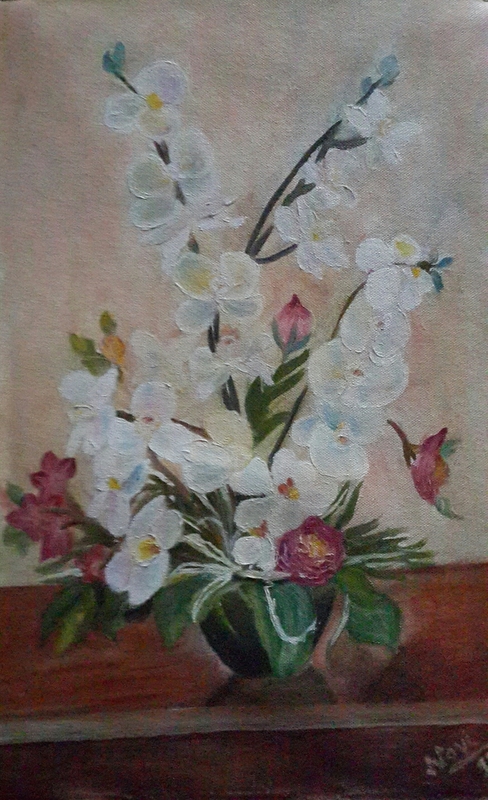 The crystal vase, the bunch of flowers and leaves, all presented a challenge to amateur artist like me. One by one, I started tackling the issues. 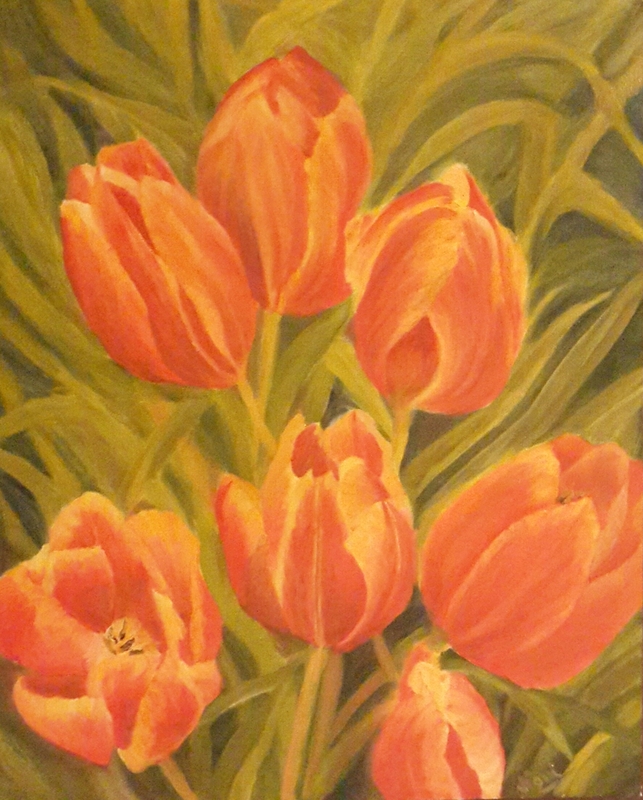 The flowers required highlights day after day as the layers of oil paint dried. 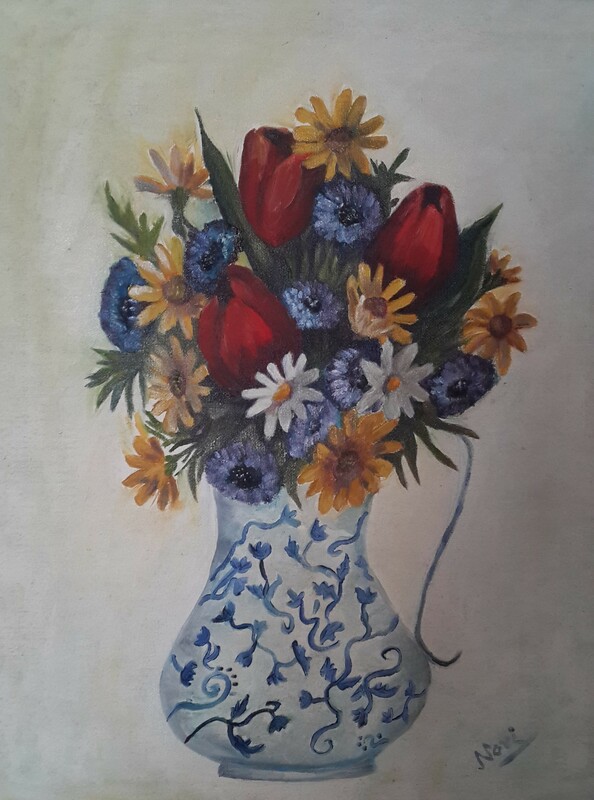 The vase had to depict the shadows and light at various places along with stems of the flowers it holds. 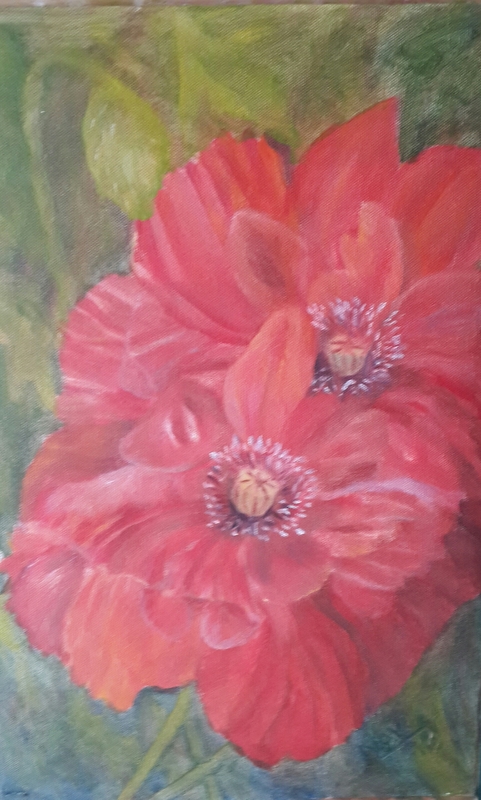 The dark green foliage gives depth to the painting. Many mixes of blues and yellows were used to create various shade of green. Both cadmium and lemon yellow were used along with a tinge of blue and lots of white in yellow roses. 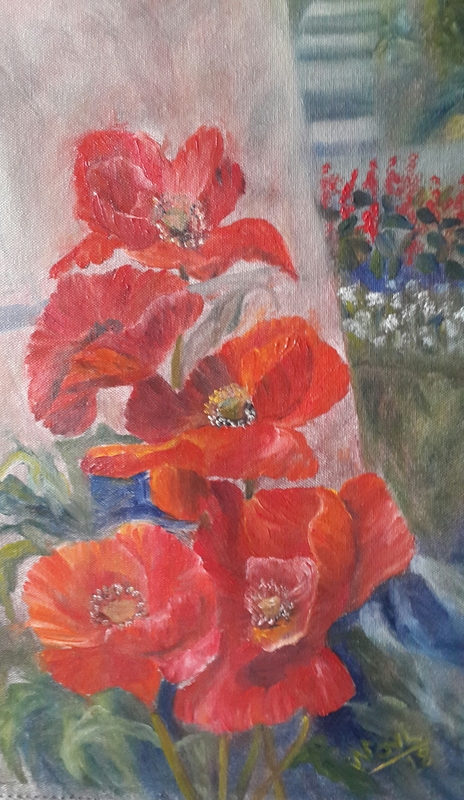 The red ones have crimson lake with blue for the darkest tone, then a mix of cadmium red and crimson lake followed by little yellow and white with red for the highlights. The rose vine with roses laden all over depicts the abundance of nature. The English roses have soft petals and glow like diamonds on a sunny day. Rose Vine 1 oil painting has an appealing one-three-four-four-one rose composition, slightly tilted towards the right. The multi layered roses blossom with all their beauty. Many petals shine in the sun and become almost translucent. The roses are surrounded with leaves, big and small, all around in different directions. Varying colours of green in different layers provide the thick foliage and give three dimensional look. The roses become more prominent with the highlighting of few leaves. The textured cream panels of the background contrast the dark green foliage. The worn out panels give the artist opportunity to play around with colours. The settings provides rustic charm and blends with nature. 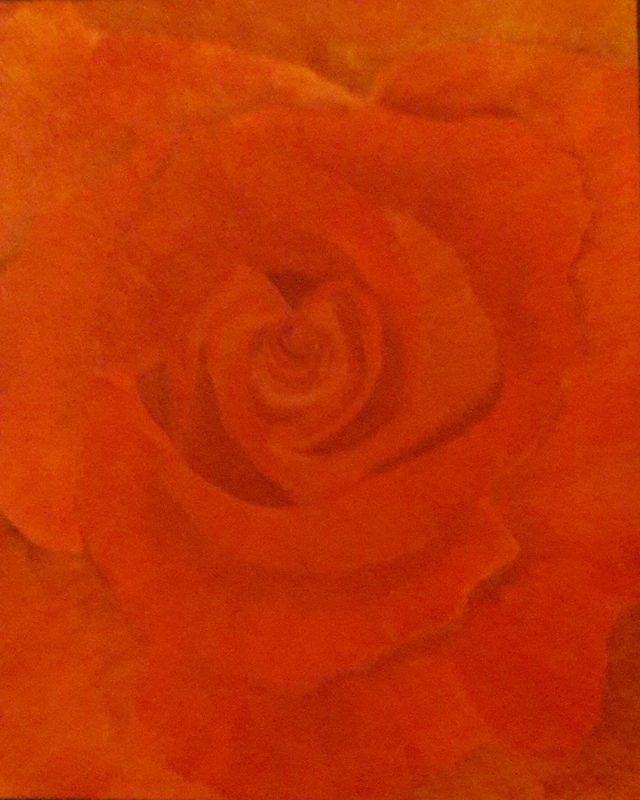 The joy of painting a rose vine was too much to be given up after one painting. So, Rose Vine 2 was created as a sequel with a different setting. 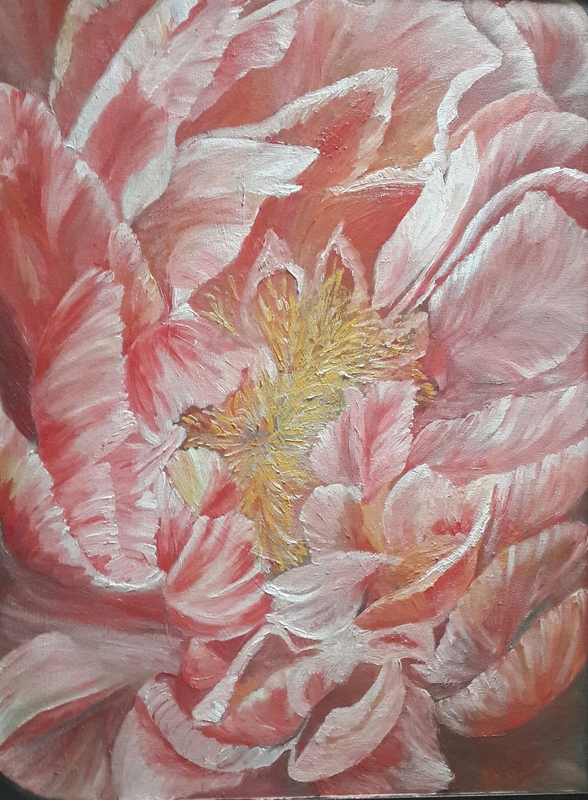 This painting is unique with bunches of rose buds and roses that signify continuity of life. 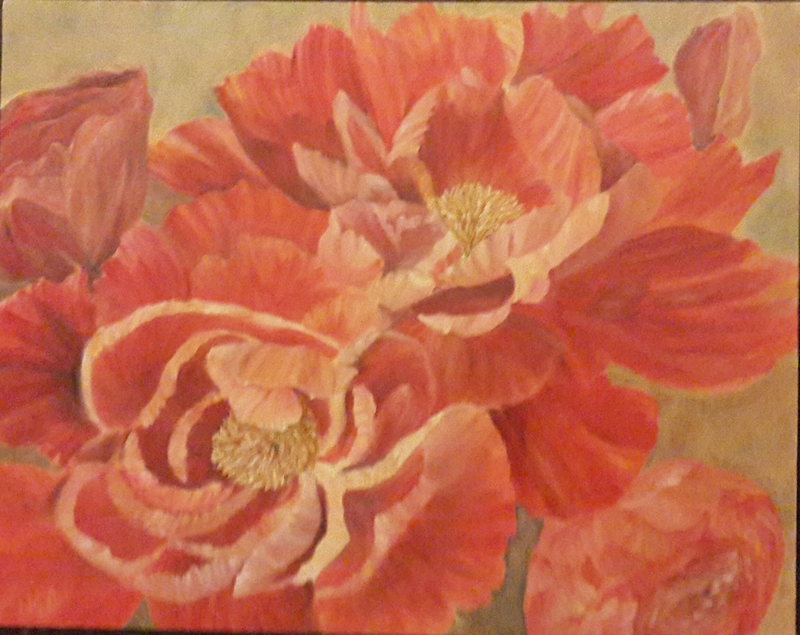 Abundance is the common theme in both the paintings. I hope you have as much joy looking at these paintings as I had while painting.